It’s a new year and I cannot believe the month is almost over. For this year I plan on posting more, A LOT more. Currently, I have about 10 projects already completed, but I just have not had the time to sit down and write about them. But all that is going to change. I need to get my priorities straight and launching this website BIG TIME this year is at the top. This year is the year of change. 1. I am finally getting to finish my son’s nursery! It’s about time since he is a year and a half! 2. We plan on updating our powder room which is a shade of BLAH with a touch of BLAH and even more BLAH when it comes to the fixtures. We have big plans for it and we can’t wait to share. 3. We are moving the office/craft/sewing room to the main floor (it’s now upstairs) since I need to get better access to it during the day while the kids are with me. I don’t like typing or sewing or crafting upstairs away from the kids. This should allow me to post more frequently and get projects completed quicker. 4. I will be adding more finishing touches to the breakfast area and kitchen. 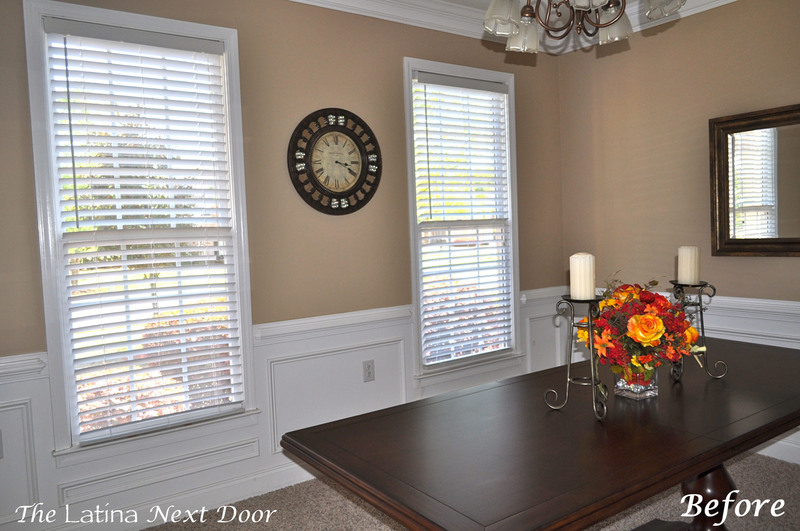 We painted but the walls are still bare and I want to add new window treatments to the bay window. White drapes aren’t working since they have been encountering too many sticky fingers lately. I have since removed them and kept them bare. Again more BLAH. 5. Our yard is getting some much needed TLC. We (which really means my husband and my father) have taken down a total of 7 (YES SEVEN) ugly overgrown pine trees that had overtaken the backyard while the previous owners and renters resided in our home. The backyard looks so much better. Pictures to come of the ongoing progress. 6. We have a deck to stain! It’s currently an ugly faded reddish brown. We are changing the color completely with a new product that is supposed to stain, seal and and transform the deck. We cannot wait! I want to be able to enjoy the back deck much more this year. 7. We have several furniture transformations that need to happen, some that already have happened and I just need to post them. Posts coming soon, PROMISE! There are more things to add to this list, but these are the main ones. I hope we can get to all of them this year. We have 11.5 more months to go! 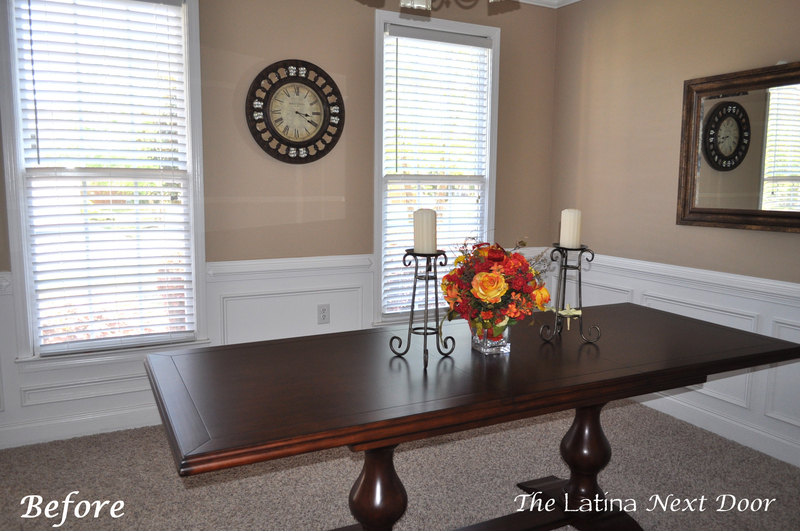 We were able to get a good start on the dining room right before the end of the year. 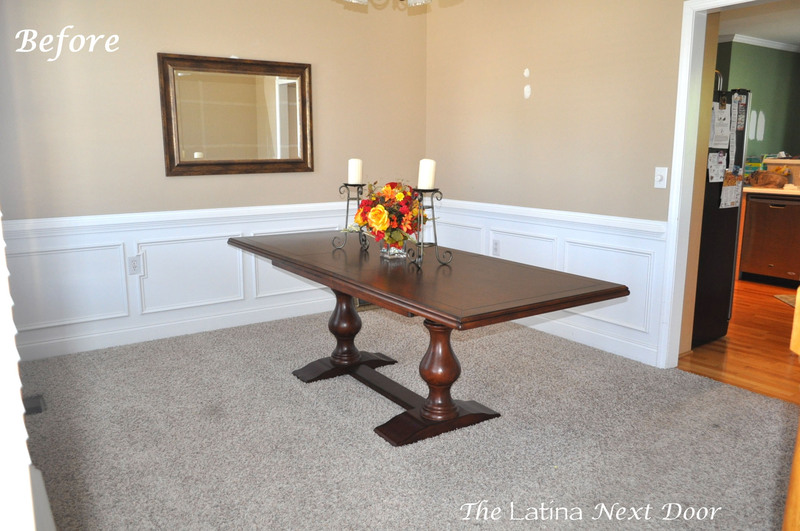 Here are the before pics of the dining room to get the mood and momentum going. It was pretty builder-grade. And we only really had a table, a mirror and a clock on the wall for all of last year. 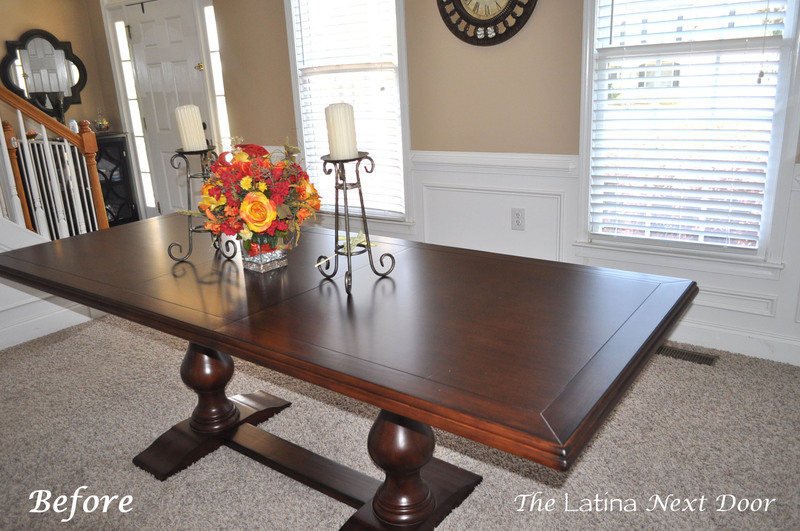 By the time the holidays came, I was ready for a formal dining room. 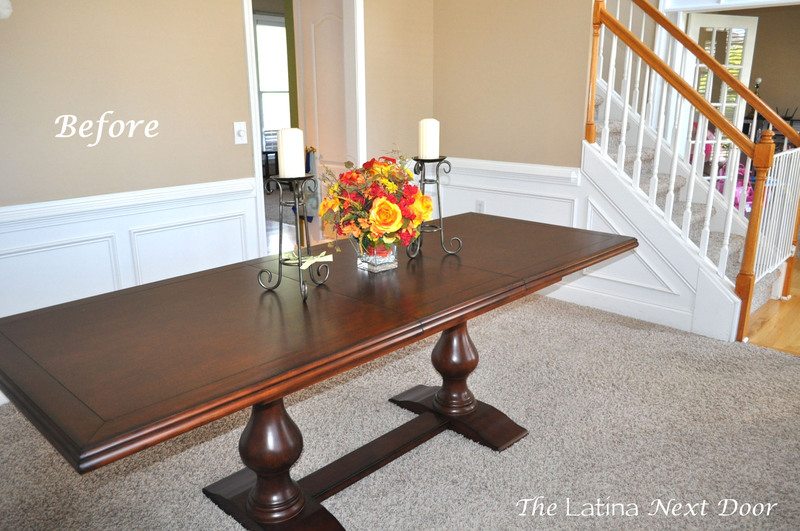 So far, my hubby and I are enjoying the transformation…. Enough yapping, again here are the before pics. The top picture is the view from the main entrance to the house. A wider shot from the main entrance. 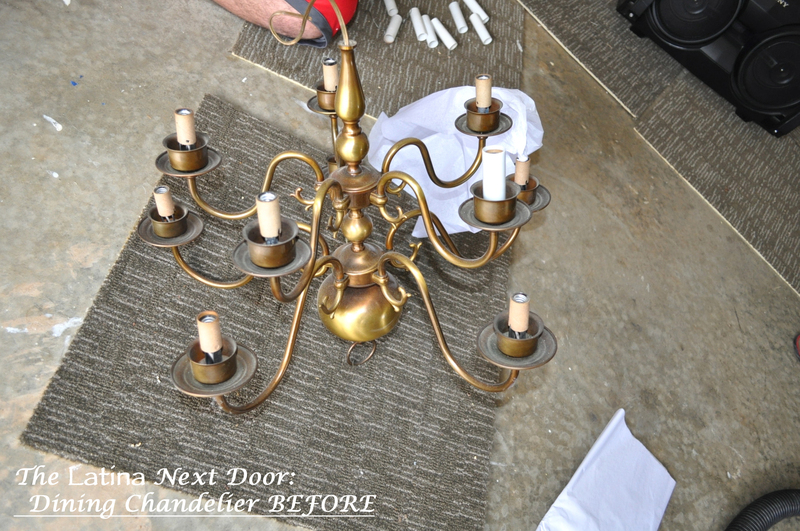 Above is the really hideous chandelier that USED to hang in the dining room. Took that sucker down! Here is the view of the windows. You can see the entrance from this view. 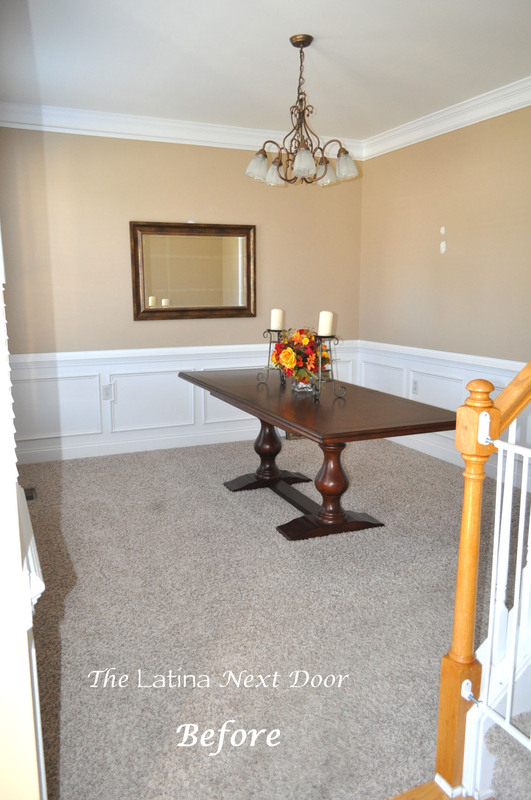 Lastly, you can see what the dining room looks like from the entrance coming off of the kitchen. 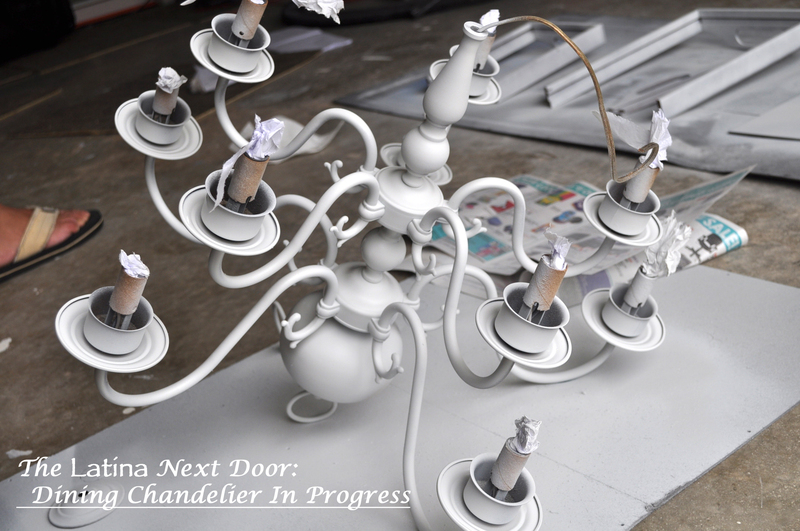 Okay, so FIRST let’s talk about that chandelier. I wanted something traditional that I could update with paint, but most of all CHEAP. 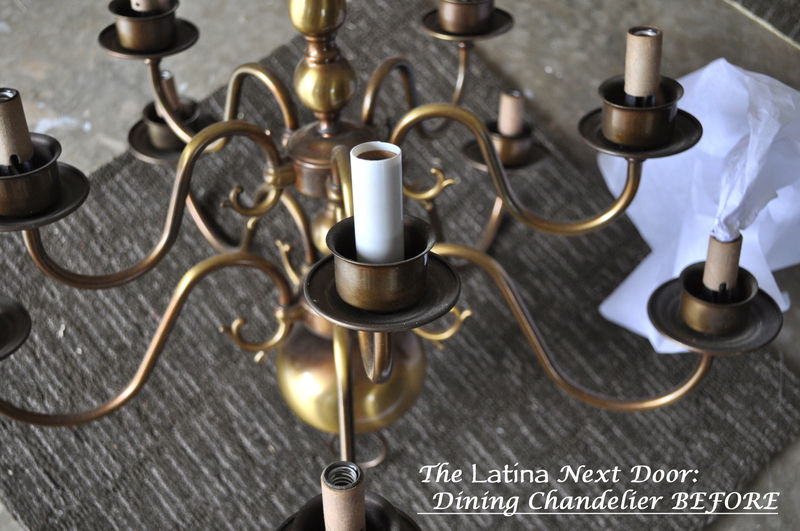 I found the chandelier below on Craigslist which I scored for $20.00! We ended up removing the white sleeves and replacing them with new ones. Some were cracked and others we cracked by accidentally stepping on them. OOPS! They were pretty brittle though, so we got 10 new ones at Home Depot. 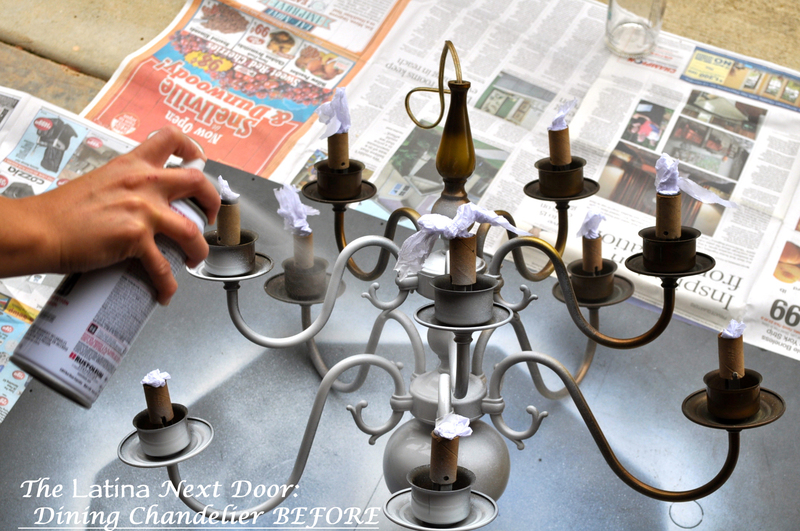 We stuffed each bulb socket with tissue and then began spray painting. I had a bit of doubt as I was spraying it, but when I saw it with the primer, I knew white was the way to go. Here it is completely primed. The actual finish is glossy, but it didn’t really look much different in the pictures for some reason. 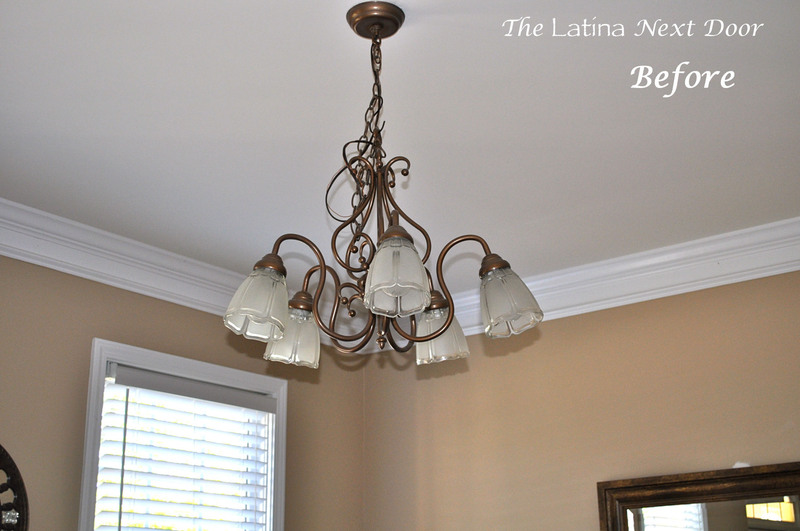 Here is the dining room with the new chandelier and the walls bare and spackled. I chose I really light blue. 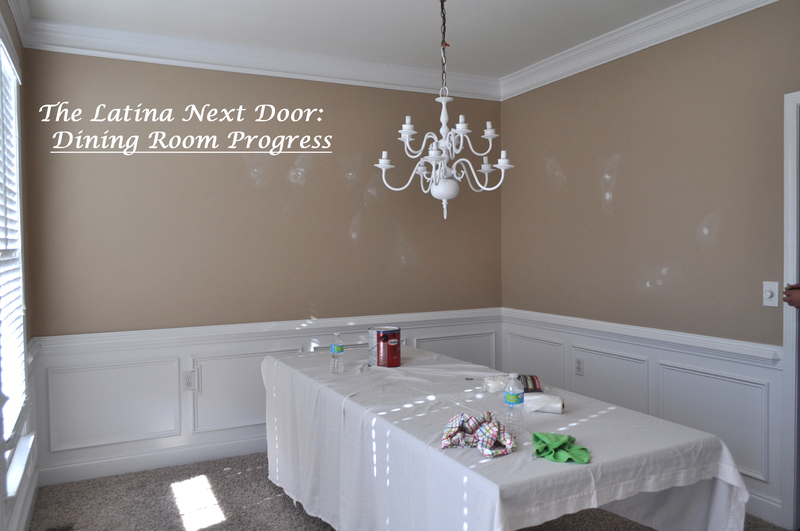 This room was a bit of a challenge since we had to paint all the white trim. It was in pretty bad shape. Lots of built-up dust that no longer could be cleaned off, lots of scuffs and dings, and just your normal wear and tear. Still to share are the Craigslist chairs we painted and reupholstered, new drapes, a custom runner, custom artwork, a new side table etc…. A LOT went into this room. Okay, that’s enough for now. Updated pics coming soon!